Dental Implant Infection - Might You Lose Your Expensive Implant? - How Serious Is It? 1. Right after the implant surgery. You can get a small infection just under the gum, over the dental implant; This happens most often within 2 weeks of the implant surgery. It's usually caused by bacteria left behind when a tooth is extracted just minutes before the implant is put in place. The gum is quite red, puffy, and sore to touch. Another possible cause is bacteria in the mouth getting in under the gum during the implant surgery. This shouldn't really happen if correct sterile surgical technique is used, but the human mouth is teeming with bacteria, and so sometimes they will get into the surgical area despite the best precautions! Either way, the bugs have found their way in there under the gum, and it is not unusual to get a minor infection like this around the top of the implant, very soon after surgery. This type of dental implant infection usually settles quickly with a short course of antibiotics. For more information about antibiotics that might be useful, take a look at Tooth Abscess Antibiotics. 2. Later on, after dental implant surgery, during the next 4 to 8 weeks, the gum over the implant can get a little swollen and red. Sometimes you might see a little pus coming out. The gum is tender to touch on the top of the gum, where the tooth would come out of the gum normally. It's not quite as sore as the dental implant infection in the first paragraph. 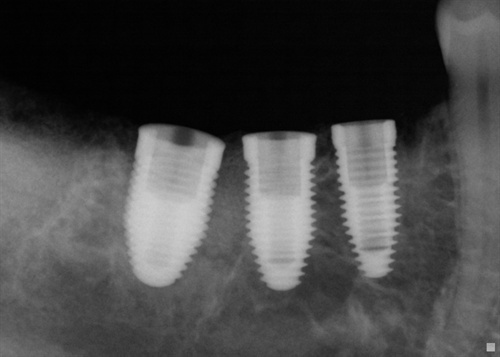 At this stage of the proceedings, this is frequently caused by loosening of the little screw that seals the implant. This can be treated by removing the screw (or "healing cap"), cleaning inside the implant, and fitting a new sterile screw, sometimes with a little smear of anti-bacterial gel. 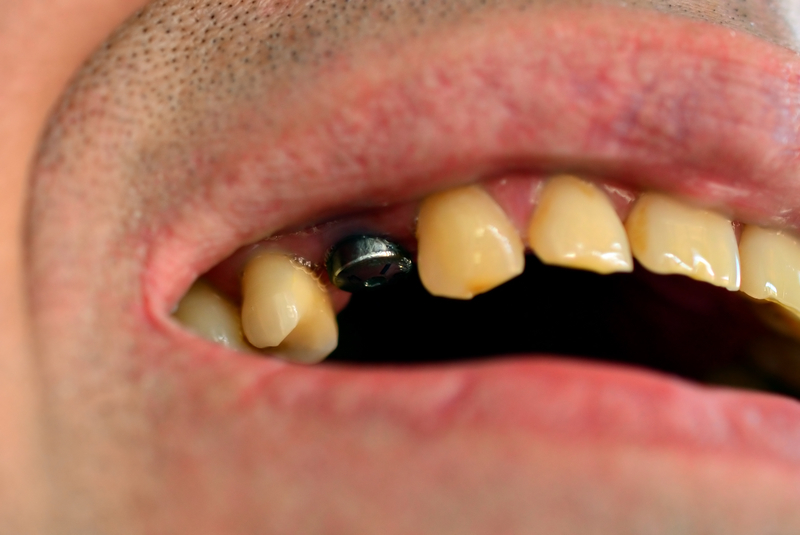 The image above shows three healing caps screwed into 3 dental implants. Image courtesy Dr. August de Oliveira. In this instance, antibiotics are NOT normally required. The source of the infection is INSIDE the dental implant, where there is NO BLOOD SUPPLY. If there is no blood supply, then antibiotics will not get there! That's why the correct treatment is to remove the healing cap, clean out inside the implant, and fit a new sterile healing cap. A really good idea during this 4 to 8 weeks following surgery is to use a mouthwash. First, you need a top-quality mouthwash. You can rinse this around your mouth AND dip your toothbrush head in the mouthwash too! A great product is the TheraBreath Perio Therapy Oral Rinse. I like the TheraBreath products Have a look at the TheraBreath Oral Rinse, at Amazon. The other thing I recommend is to apply a high-quality aloe vera gel directly onto the gum over the implant with your fingertip. The antiseptic qualities of aloe vera gel have been proven in scientific studies. Read more about this, and place your order online directly HERE. The bone right next to the implant surface just doesn't heal up as normal, and does not grow into the microscopic pits and fissures of the implant. This thin layer of bone around the implant then becomes infected, and the the area is extremely painful. The gum around the implant - at the outside next to your cheek and on the inside next to your tongue or palate - is tender to touch. 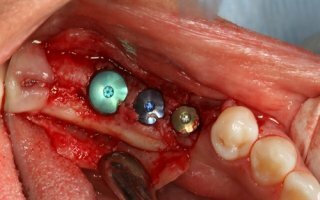 In the image above, you can see 3 dental implants that are well-surrounded with bone. No dental implant infection here! Image courtesy Dr. August de Oliveira. While the infection can be reduced with strong antibiotics, the bone will not heal with the implant in there. The implant must be removed. Frequently, the layer of bone right next to the implant surface has died, and does not have a blood supply. It cannot heal without a blood supply. If this situation is left to continue and get worse, it could lead to a very serious bone infection called osteomyelitis. This can be difficult to treat, and usually involves surgery to remove the dead bone. READ MORE AT Jaw Bone Infection. Obviously, we want to avoid this type of dental implant infection as much as possible! 3. After the implant has settled, and the crown or bridge put on, it is possible to get a minor but persistent and annoying inflammation around the neck of an implant, where the gum edge meets the implant. 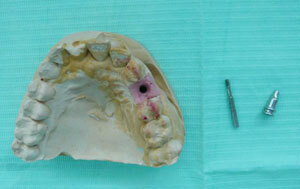 This can be due to the tiny microscopic gap between the implant and the crown, hiding bacteria. The gum edge just gets red and slightly puffy. Dentists call this tiny space the "microgap". Some implant designs seem more prone than others to collecting bacteria in the microgap. The best way of treating this microgap infection is to unscrew the crown or bridge, and clean the components thoroughly, before re-fitting, again with a tiny smear of anti-bacterial gel. 4. The last possibility of dental implant infection is when you don't clean around the implant carefully enough later on. Bacteria can build up gradually, just like on a natural tooth, and cause gum inflammation and gum disease. Over a period of time, it could lead to the gum shrinking back from around the implant, allowing the dental implant to work loose. By then, it's too late. Once the implant is loose, it means it's no longer fixed in the bone. It will never become firm again, and must be removed. So it is very important to clean around your implants very slowly and carefully. You can't do much about the first 3 possibilities, but you definitely CAN eliminate the 4th by careful brushing and flossing at home! HOW TO CLEAN AROUND YOUR DENTAL IMPLANTS. You have invested a lot of money and usually some discomfort in getting your dental implants, so it makes sense to look after them! After all, you wouldn't let your brand new Porsche just sit in the driveway and never clean it or service it! My first tip is to get a TOP quality brush. 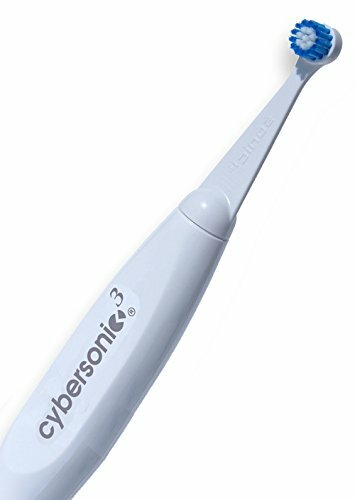 The one I recommend is a sonic care toothbrush called the Cybersonic3. Don't worry, it's not expensive - about $50 if you get it direct from the Amden website using MY SPECIAL DISCOUNT CODE. It's amazing value for money. So it really does pay you to invest a little time in maintaining your implants. Fortunately, the procedures are pretty much identical to caring for natural teeth, and you can read all about what you should do at a page I've written on cleaning your teeth correctly. Just click on this link - How to cure gum disease. I'm NOT saying you have gum disease, BUT if you DON"T follow my advice on that page of my website, then you PROBABLY WILL GET GUM DISEASE around your implants. An expensive and painful mistake! First, if you have any allergies to specific antibiotics. Second, what other medications you are currently taking or have taken recently. Third, whether the infection is in the jawbone or in the soft gum. For bone infections, Clindamycin is probably the best. It penetrates bone extremely well and can be used at a relatively low dose, typically 150mg four times a day. It's also the next choice for people who are allergic to the penicillins. 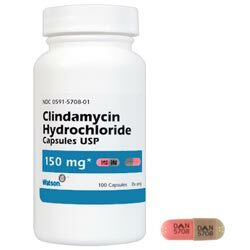 However, Clindamycin must be used with caution as it can cause serious stomach problems in some people. For soft tissue - gum - infections, either Amoxycillin or Metronidazole are good. You must avoid alcohol if you take metronidazole. To sum up, minor dental implant infection is not unusual, especially soon after the implant surgery. It does not necessarily spell the end of your implant, BUT there's a small chance that it COULD BE SERIOUS, so ALWAYS get it checked out by your implant surgeon as quickly as possible.